September from the Très Riches Hueres Cluny MS. 65 F.9_v Photo Credit: ©Photo. R.M.N. / R.-G. Ojéda via Wikimedia Commons. This grape-picking scene from the Très Riches Heures is one that was completed after the death of the book of hours’ original owner, Jean Duc de Berry. The Duke died in 1416, as did the three Limbourg brothers. In 1485, the Duc de Savoie, who acquired the unfinished manuscript, had the artist Jean Colombe finish half of September. Jean Colombe relied on a placeholder sketch previously made by the original artist. The top portion of the scene, featuring the Château de Saumur, was completed earlier. In the warmer wine-producing parts of Europe, September, even now, brings the grape harvest. Peasants took to the fields in September to pick the grapes, engaging in the standard labor of the month depicted in the the calendar pages of books of hours for the month of September (at least in warmer climates). If you look at the detail from the central portion of this calender page for Sepetember, you can see that the Château has a mote, with what appears to be a small draw bridge before the entry. A woman with a basket on her head is entering, and a horse (surprisingly it does not appear to be a donkey) with panniers is leaving. Between the Château and the grape vines is an enclosure that served as a tilting ground for tournaments. Just to the right of the tilting ground stands an ox. In the lower portion of the scene, the grape pickers cut bunches of grapes from the vines and place them in baskets. If you look closely, the two pickers on the bottom left, both in grey, a woman wearing a white apron and a dark head-cloth and a man in grey, appear to be holding grape knives; these knives would also have been used earlier in the year to trim the vines.1)Called a billhook, this frequently used gardening tool had a double-edged curved blade and sometimes, an additional spike or point. It’s not that different from a modern grape harvesting knife. In Latin, the vineyard variety of a billhook was a falx vinatoria. Baskets of grapes are filled and placed in the panniers on the donkeys, or in the large barrels in the ox cart to the right. On the bottom left, a woman in blue and red with a adjusting her maroon head scarf and a white apron appears to be very pregnant. Just behind her, to the right, a young man in brown is sampling the grapes. In the middle right, a peasant is mooning the viewer. Detail of the calendar page for September showing the Château de Saumur in the background, and peasants harvesting grapes in the foreground, the typical labor of the month in France. 1. ↑ Called a billhook, this frequently used gardening tool had a double-edged curved blade and sometimes, an additional spike or point. It’s not that different from a modern grape harvesting knife. In Latin, the vineyard variety of a billhook was a falx vinatoria. The calendar pages for June typically feature the zodiac symbols associated with Cancer the crab. The labors for the month are often the wheat harvest (reaping), or cutting hay and raking it to dry first in windrows and then stacks, or sometimes, sheep-shearing. 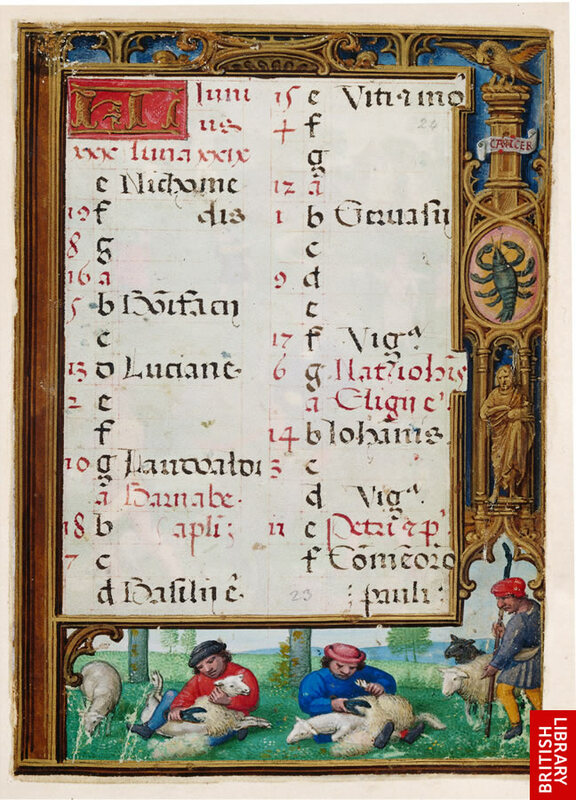 Sometimes calendar images for June show a fallow field being plowed and re-seeded, or, as the seasonal rhyme for the labors of the months notes “Junij And I wede my corne well I-now,” June was often a time for weeding. 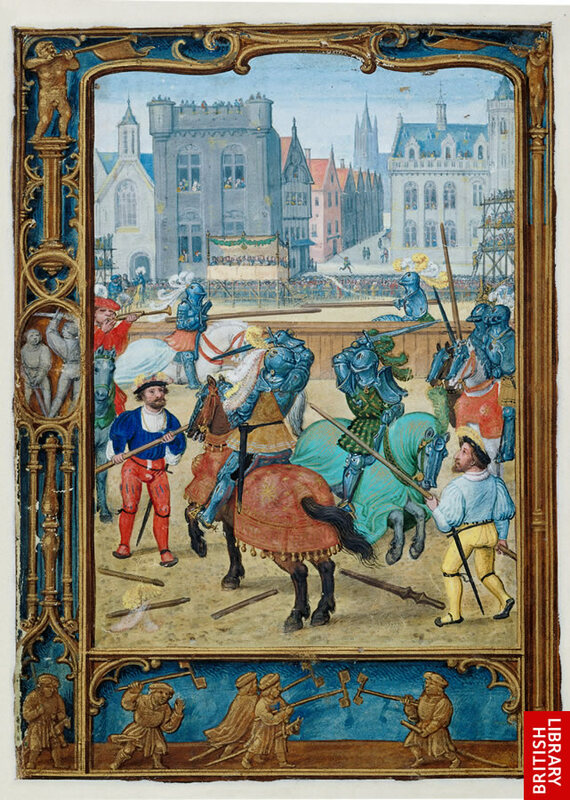 In this pair of leaves from the British Library’s Golf Book, on the left is an atypical but nonetheless appropriate scene showing a tournament, a formal series of contests and games of a martial sort, participated in by aristocrats who could afford the time, equipment and horses necessary for upper class sport. In the larger version of f. 23v above, you can see two mounted knights in armor with swords in hand oin the front, a trumpeter serving as herald on the top left, and another pair of mounted knights jousting with long wooden jousting lance, and more mounted knights waiting for their turn on the right. Behind the knights is the wooden fence marking off the tiltyard. In the foreground, on the dirt, are a number of broken lances. Below the central image is a series of small decorative images in the border shows men or teenaged boys playing with hobby-horses, and toy windmills. The right-hand folio is the actual calendar for June, with the astrological symbol for Cancer, the crab in the border on the right. Below the calendar is a pastoral scene showing shepherds shearing sheep. You’ll notice that modern sheep shearing is remarkably similar. The sheep is turned onto its back, the shearer may throw a leg over the sheep to help keep it still, and the object is (still) to have a continuous fleece, rather than a bundle of strips.